Kids weeks 14th- 28th August -Free tickets for shows for kids. If any of you have kids aged 5 -16 or know anyone who does,check out www.kidsweek.co.uk where you can currently book for a selection of shows and activities where the kids go free with an accompanying paying adult. During Kids Week (14-28 August) a child aged 5-16 years old can go free to any participating show when accompanied by an adult paying full price. You can also purchase up to two extra children’s tickets at half price. Shows include High School musical stage show, Stomp and The Lion King. There is a limited allocation per show and the offer is subject to availability and not applicable to tickets previously purchased. Booking is now open so check it out! Go through the alphabet naming an animal that begins with each letter. Then you can move on to boys names, girls names, countries,food…. the possibilities are endless depending on the age of your kids! Make up different kinds of animals by using one or both of your hands. Can you make a slithering snake? What about a butterfly? A dog? A snail? Take turns to guess what animal each of you are making. You can also make up short stories of big adventures for your clever hand puppet creations. Leaving On A Jet Plane? I Like Driving In My Car (It’s Not Quite A Jag-u-ar). Think of as many songs as you can that are about cars, boats, planes, bicycles, or other means of transportation. Then, you can extend your songs to include other themes or words: “Love” and “baby” are good ones. What are all the natural and man-made things you can think of that fly? That roll? That move on two legs? Or four legs? That slither on no legs. Things that bounce or buzz? If you’re travelling on a boat, then think of things that can swim. Travelling by car? Then think of wheels. 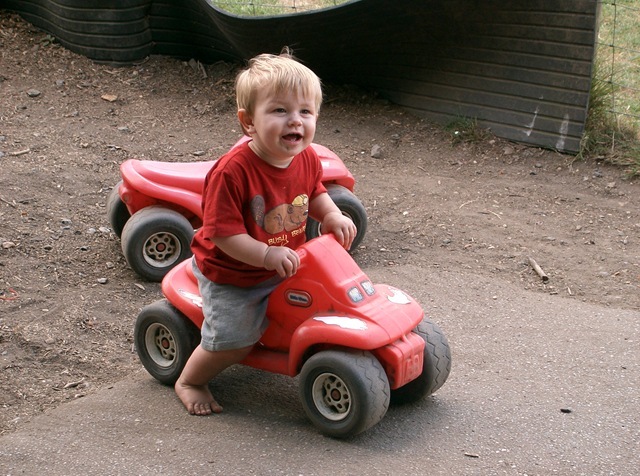 What’s the tiniest means of transportation you can think of? Maybe a Little Tikes car or a Gee wizz electric car. And what’s the biggest? The Airbus Giant jumbo? Name all the different methods of transporting humans you can imagine, starting from the teensiest. Other things my kids love are story CDs. We have a collection of freebies that my parents collected from the Daily Mail but you can buy them in places like WH Smiths and Tesco quite cheaply. Our favourites are Paddington and The Cat in the Hat. Andrew likes The Famous Five whereas Matthew is a Mr Men fan. (the intro music on these is very repetitive and can drive you slowly insane!). Focus on the family do a fantastic series of Radio broadcasts called Adventures in Odyssey which I thoroughly recommend for kids aged 7 and above. You can get these from Christian bookshops or websites.